Rebecca L. Robison is a Partner at Helms Robison Lee & Bennett, PA. She received her Juris Doctor from Capital University Law School in 1997. Prior to law school Rebecca received her Bachelor of Arts from The Ohio State University, and her Associates of Arts from Saint Mary’s School in Raleigh. Rebecca was raised in Alamance County, North Carolina and returned home to North Carolina after completing her education. She was licensed to practice law in North Carolina in 1998 and began her legal career in Union County as an Assistance District Attorney. In 2001, Rebecca left the District Attorney’s Office and started her own law practice concentrating in family and criminal law. Rebecca joined Helms Robison Lee & Bennett, PA as a Partner 2005 and created the firm’s family law practice area. Rebecca has concentrated in family law since 2003. 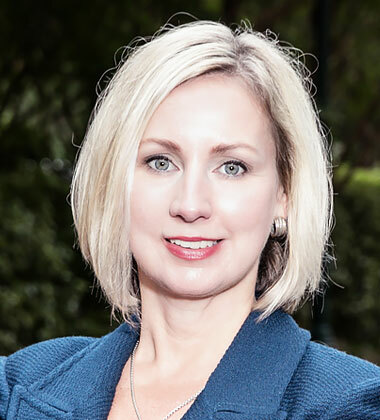 In 2010, Rebecca was certified by the NC State Bar as a North Carolina Board Certified Specialist in Family Law. Rebecca became a NCDRC Family Financial Mediator in 2015. She assists clients with Divorce, Child Custody, Child Support, Equitable Distribution (Property Division), Post-Separation Support, Alimony, Separation Agreements, Domestic Violence, Adoptions, Grandparent Custody, Termination of Parental Rights, as well as other family law related issues. Rebecca lives in Union County with her husband and their three boys. She is active in her boys’ school and Boy Scout Troop. Rebecca serves on the Union Academy Foundation, is a member of the Union County Chamber of Commerce Women in Business and supports many local non-profit agencies. Rebecca enjoys playing golf, traveling, watching her boys play baseball, and spending time with her family.